Kojo Senoo/Pipe Dream Photographer Graduate student Darren Yu won the title of 2018 Vice East Coast Beatboxing Champion. A graduate student’s passion for beatboxing has catapulted him both on a local and national platform. 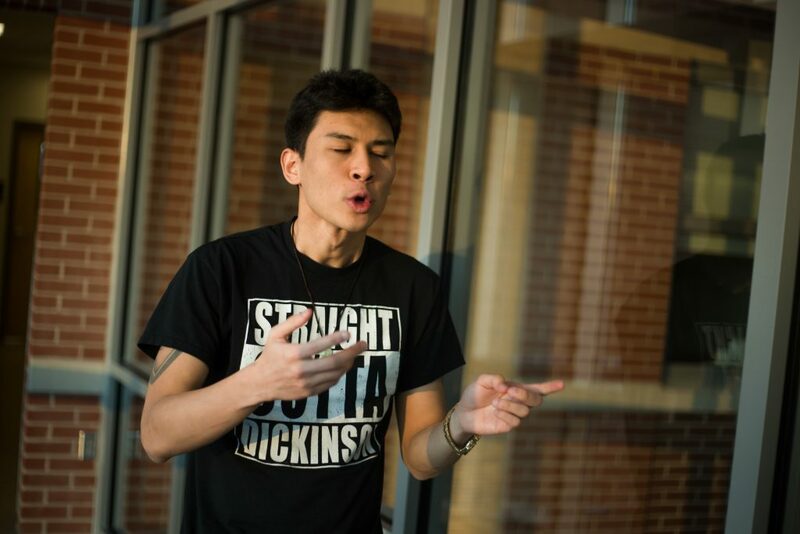 Darren Yu, a first-year graduate student studying business administration, won the title of the 2018 Vice East Coast Beatbox Champion when he placed second at the regional competition held in Boston this past December. Going by his stage name “Ghost,” Yu also performs with Sofar Sounds, a music company that hosts shows in large cities such as New York City, Los Angeles, London and Tokyo in an intimate music venue. Although he has traveled across the country throughout his four-and-a-half-year beatboxing career, it all started here in Binghamton. Yu first started beatboxing in his dorm room in Dickinson Community when he was an undergraduate student at Binghamton University. Making unique sounds with his voice was always an amusing pastime, but Yu seriously started working on beatboxing when he began watching tutorials and videos of prominent beatboxers. By mimicking the sounds and routines of distinguished beatboxers SkilleR and Reeps One, Yu quickly taught himself the art. Along with watching videos, Yu learned a lot about beatboxing through fellow students who shared his same enthusiasm for the art. Unfortunately, the beatboxing club did not exist when Yu was an undergraduate, so he and other students created a temporary beatboxing community where they could support and learn from each other. Starting off with short performances for his dorm community, Yu worked his way to performing at some of Binghamton’s most prominent showcases such as Asian Night, China Night, Japan Night, Korean Night, the Men of Color Award Show and the Spring Fling Student Show. He now has four shows scheduled for this month alone including the Chinese American Student Union and Vietnamese Student Associations’ Lunar New Year Banquet and the Asian Creative Network Showcase in New York City. This summer he will be attending beatboxing competitions in Atlanta, Brooklyn, Boston, Chicago and Poland. Despite his many accomplishments, Yu said he wasn’t the best when he first began beatboxing and owes his success to his experiences and overwhelming support in Binghamton. When it comes to new, aspiring beatboxers, Yu said to always remember to cherish the reason why they started pursuing the art in the first place. Although Yu was content performing at local shows, the turning point in his beatboxing career came when he started competing. Although the competitions can get fierce, Yu said he still loves meeting and forming relationships with the tight-knit beatboxing community. Throughout his experiences, Yu has developed his own style of beatboxing, which stemmed from his love for dubstep, a genre of electronic dance music. He says much of his progress comes from creating his own flair. By pursuing his passion and connecting with people who share his sentiment for beatboxing, Yu said he has found a sense of belonging.